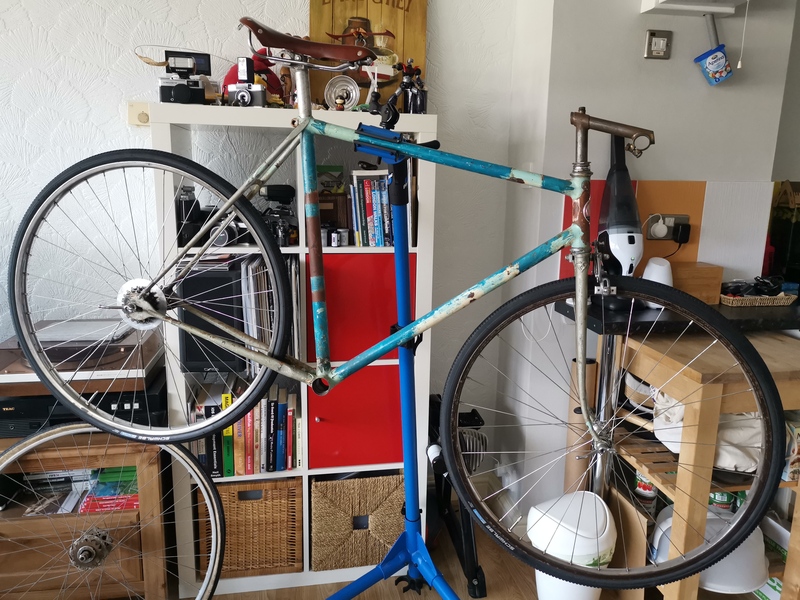 A 1952 Gillott path racer. Well, it looks as though we've got a useful little group for our 'Day in June', as it now turns out to be. A more imaginative name could be an improvement here. As discussed above, there's no need to decide the exact route and cafe stop - we'll see who turns up and how we feel on the day. I will try to check before hand that all the possible cafes are open. We can talk about possible road hazards before we set off, but I will mention now that we are likely to go down Winter Hill (shortly before Marlow) and this is a fairly steep descent with a longish straight section followed by a sharp hairpin. Be careful of this one! with your interests, you would find membership a worthwhile investment. I stand corrected about the current popularity of tubs (at least in this group). But on this subject have a look at the attached pic. 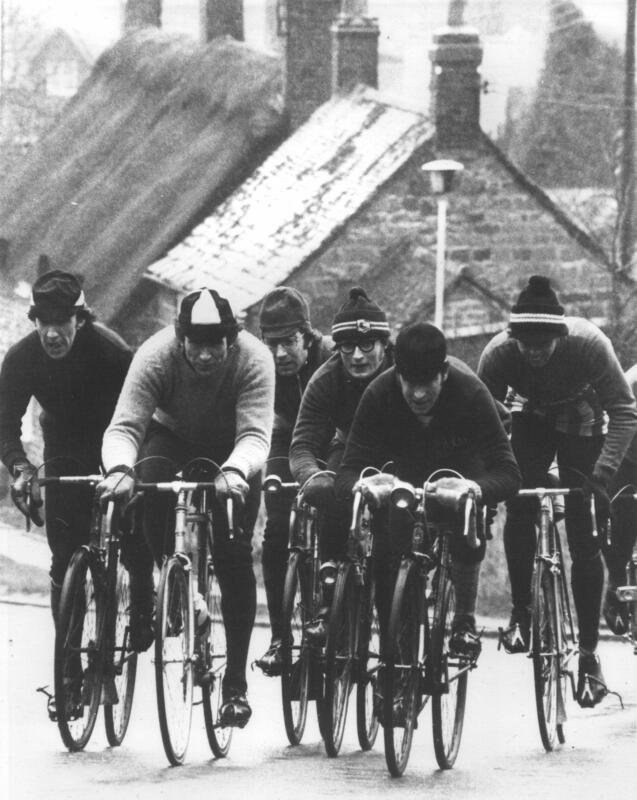 It dates from the mid '70s and was taken by Bernard Thompson (a well known Cycling photographer and journalist at the time) it is one of my all time favourite cycling photos. He titled it 'On Rockingham Hill', but I'd be inclined to call it 'Jeff Demonstrates the Superiority of Tubs'. Jeff Marshall is the rider near the centre with the black and white panelled cap - he looks happy while most of the others look as though they are being tested, and they are on heavy 27" pressures which are really better suited to the grit strewn February roads. The riders on heavy tyres were also on single gears - mostly fixed. I wasn't on that year's ride, but I did go on some subsequent ones (it was an annual 'training' weekend, 100 miles on Saturday, same on Sunday back home), and I can tell you we had an awful lot of puncture trouble with light tyres. I'll be using the wheels from the Holdsworth as the other sets need to be rebuilt with new spokes. 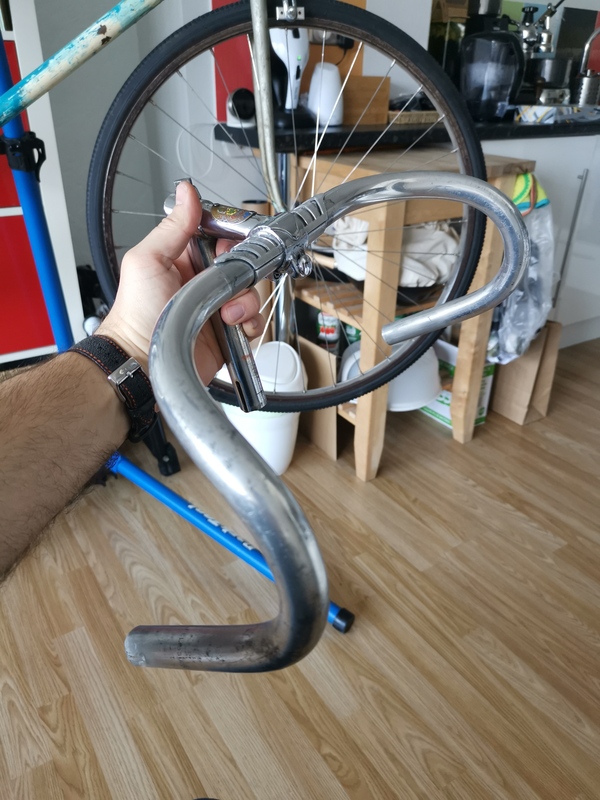 I'll probably have to use a CB stem and bars combo as I can't seem to be able to remove the bars from it. Need a BB though. 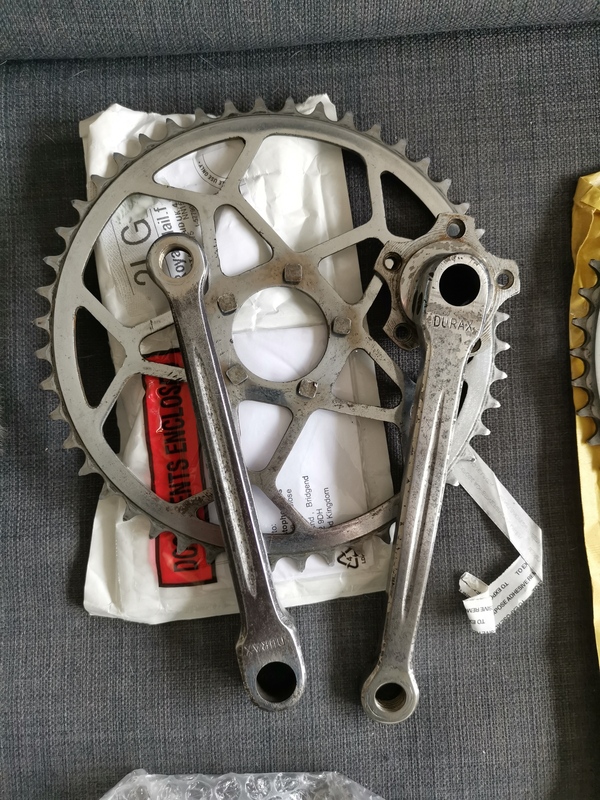 Got a choice of Durex and BSA cranks. If it's the five pin fluted durax cranks, then definitely those? 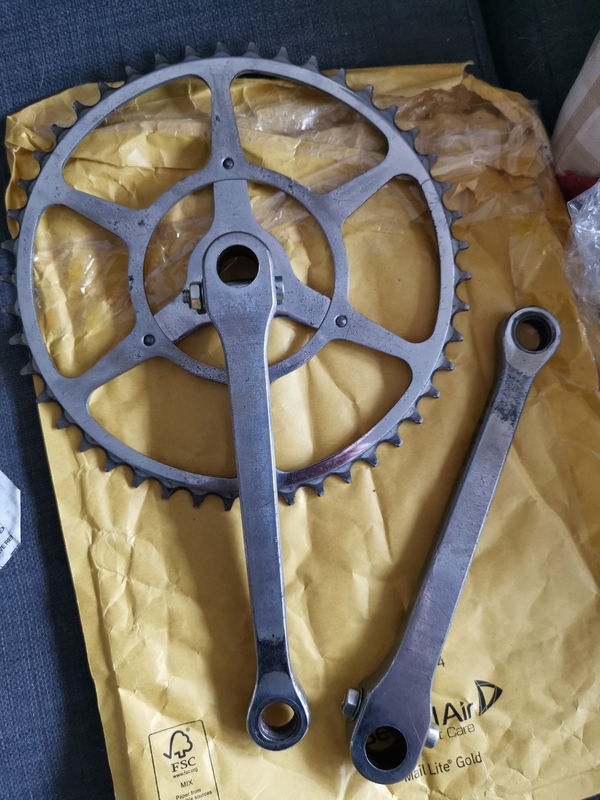 the BSA cranks were as far as I'm aware their base base model, as the crank doesn't detach from the chain ring. These ones too. Williams, I think? Actually the opposite. They felt heavier. I guess it's a lot to do with durability and strength as much as weight? The Durax cranks are nice. And yes, it's about durability more than weight. Was just stating they felt heavier but are indeed lighter. Albeit by a few grams. 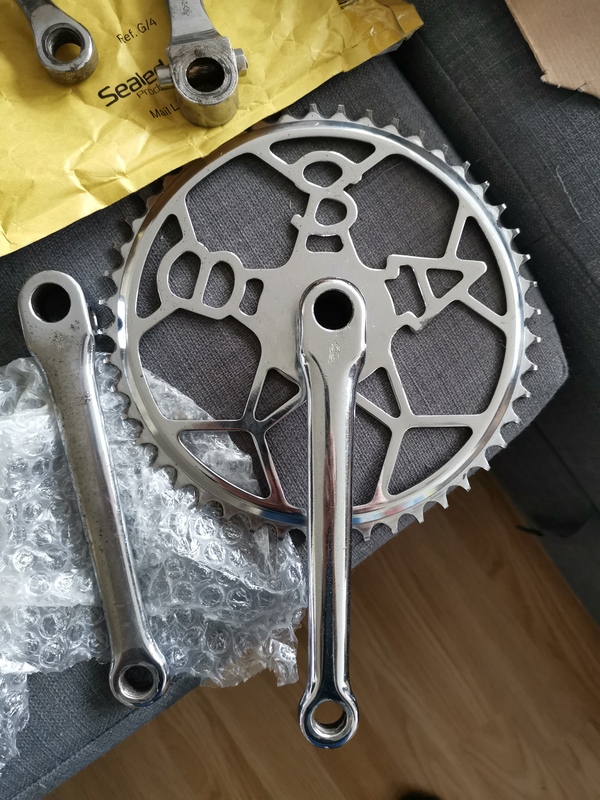 Should you not be considering the length of the cranks? Some people find this is critical, others less so. Personally I can't get on with anything other than 6 and 3/4" (170mm), but others seem to be able to adapt. I have a good anecdote on this but it can wait till we meet. BB spindle length: there's quite a bit of variety - ideally you want the shortest spindle that will allow the chainring to clear the frame. I can't remember how the BW numbering system works, but you should probably avoid a spindle stamped 'GCC' (gear case clearance) . 'NGCC' would probably be OK.
Each of these will have a different spindle. 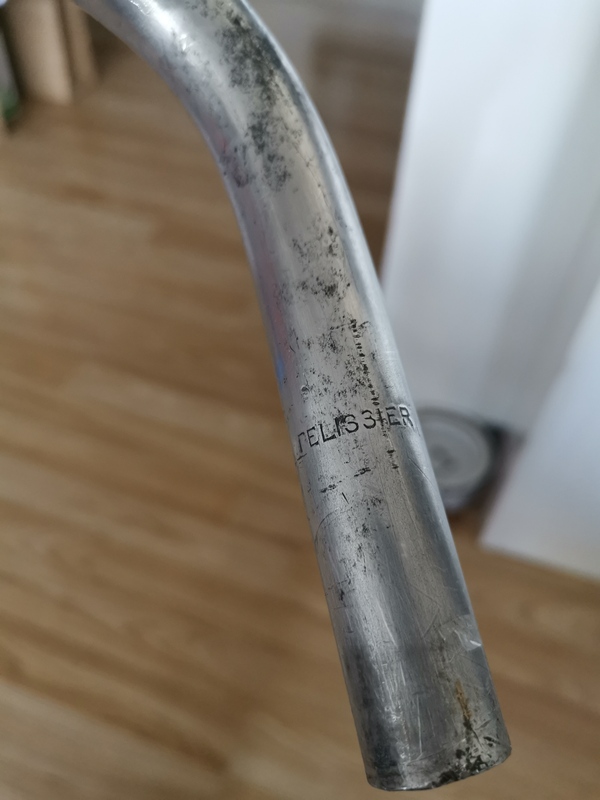 Of course you may get away with excessive clearance, but it can affect the chain line badly, and I find it has an adverse effect on my right knee. You may well know this, but the 5 pin chain ring in your photo appears to have the fixing bolts screwed in from the front side of the ring - they actually go in from the back (as with the Williams). Personally, I like the Williams C34 (that's what you have there). They are a good, down to earth set, and there are plenty of spare rings knocking about - I may even have the one you need! Good tip re the pins on the chain ring! I'd have mounted them as they were. So, no, didn't know that. and didn't realise. When deciding which chainset to use, you need to consider wear on the chainring teeth. 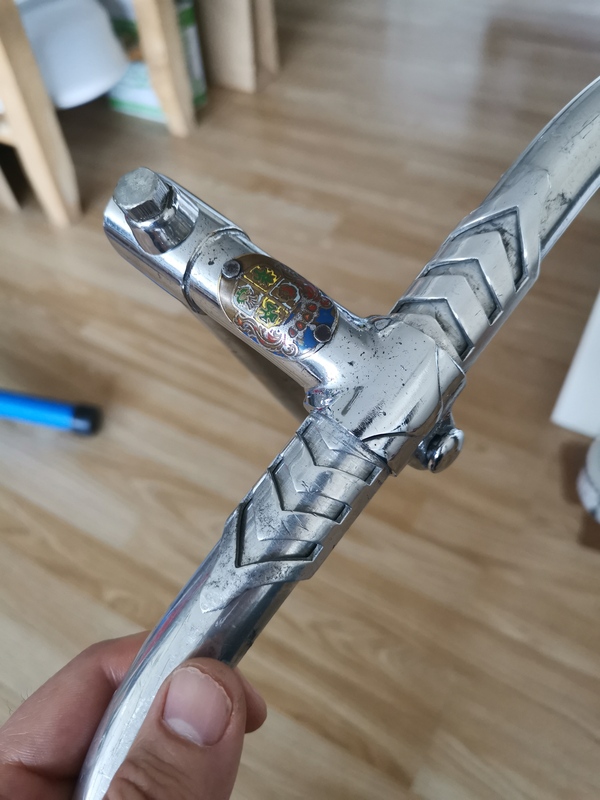 There's no sense in fitting some prestigious brand if the only ring you've got is clapped out - you're building the bike to ride it, not just to look at. It's a bit hard to tell from your pics, but the 5 pin ring seems pretty good while the Williams looks past its best. All 5 pin rings seem to be interchangeable ( although TA and other metric rings will need a little 'easing' with a half round file to get them onto an english crank). Bear in mind that the teeth do not wear evenly - those in contact with the chain at top dead centre and BDC have no pressure on them and therefore no wear. It's usually possible to move the ring through 90 degrees so that the worn teeth are relieved of pressure. "I can't remember how the BW numbering system works..."
That's a useful reference: Steve knows what he's talking about. Chater - I don't recognise the numbers Steve quotes and I guess they must be for bearings using 1/4" balls. The number I know for 5/16th" balls with a single ring is 1007. TA - 314 is intended for single rings, but I have used them with a double by putting a spacing washer behind the fixed cup. I've done this because I like to make the 'tread' (i.e. the distance between the pedals) as narrow as possible. The spacing washers are the the same as those used to put behind a screw-on block. This trick may also be helpful where a cottered spindle is slightly too short to give clearance. Another little trick which can gain a few thou is to file the side of the cotter pin so the crank can sit slightly further out on the spindle. (maybe I was a slow learner). You will probably (but not certainly) find that your new cotter needs filing to get enough thread to fit the retaining nut and its washer. Do not try to force it with a hammer. Crank forward, nut upwards is the English practice. Continentals usually fit them the other way, but I don't think this is a big enough issue to justify Brexit. I am aware of two sizes: English and continental, the continental being slightly smaller in diameter. I had never noticed a difference in length. I think the 8.5 mm must refer to the diameter, not the length. Your Durax cranks may need the smaller size, the Williams will take the larger size. I expect a cotter pin to cost 6d. but, as you know, I live in the past. I do realise that 50p would be the rough equivalent now. No old established bike shops near you?